Cave Story is a retro side scroller that was a pretty big deal when it came out for the 3DS. I remember seeing it all the time back in the day. After all these many years I finally got to play it and it is definitely a pretty solid title. It has a good amount of difficulty which should challenge and frustrate even the most skilled players of the genre. The game starts off with two “kids” (seemingly) chatting through their computers. One of them is locked up in a hut while the other one has managed to escape from the villain organization. Their predicament still isn’t great though as the villains are looking to kidnap Sue again. (The one who escaped) Fortunately, a Robotic soldier from the surface has shown up and decides to help these guys out. He will stop the nefarious organization and save the world. This soldier may be brave but is he up to the challenge? One thing you’ll notice right away as you play the game is that the title is very cryptic. You are kept on a need to know basis as everyone makes references to past events or tell you parts of stories that you have to fill in on your own. As you talk to more and more NPCs you will likely have more and more questions. The game is definitely trying to set up a lot of lore and I’m sure it was fun for some people to decipher it all and put it in a wiki. I’ve always been content to figure stuff out in my own as well and don’t think the game/any form of media should spoon feed you all of the info. Let us figure out most of it on our own and only give the really crucial parts. The gameplay is like the classic Mega Man games. It’s primarily run and gun as you go through the levels. It is part RPG though so it’s not as simple as merely running to the goal each time. You will have to talk to people and go back and forth to get the necessary items to carry on. The backtracking isn’t all that extensive though so I wouldn’t really worry about that part. You start out with a classic beam gun and quickly get missiles. How the game works is each gun starts out at level 1 and can be upgraded to level 3. Enemies drop the energy that you use to power up the weapon. Taking any damage will then cause you to lose the energy. Thus, the game highly rewards a patient approach as you try to clear the game without really getting hit. You gather energy quickly so it’s not as if you can’t afford to get hit but I like to see how long I can last. One thing to note is that level 3 of the upgraded machine gun you get later on allows you to fly by shooting at the ground. Unlike the jet pack, you can fly forever this way once you also get the quick ammo reload power up. There is apparently also a powered up Jetpack you can obtain which may do the same thing but I never found it so this is a great alternative. As you play you will have to decide which weapons you really want to level up. You can level them all up of course but there is rarely a need too. Some abilities like the sword slash feel like weaker alternatives to your regular weapons anyway. Each boss has patterns that you can learn and exploit through experience and quick reactions like the Mega Man games. There doesn’t seem to be much RNG (if any) in this title which is good since it comes down to skill. Even then I was glad that we got consistent save points throughout or it would have been a tough trek. As it stands, there are two parts of the game where you go a long stretch without a save point and those parts was tough. In particular, the triple final boss is really difficult and I definitely had to retry that one a few times. Find each boss’ weaknesses and learn how to win while taking minimal damage. It’s a considerable challenge, but I’m sure you can get it done. The main character is a nice enough guy but of course he doesn’t have any actual personality. Sue seems reasonable enough but she basically spends most of the game getting kidnapped so it wasn’t her best role. The guy who was on the computer turned out to be a rather old guy and one who wasn’t very brave. When push came to shove he was ready to abandon ship and even offered us a ride home. I wasn’t having any of that and stayed in to fight. The bad ending was tempting to watch though, but I was on a mission. Either way, that guy is ally that you don’t want or need to have on your side. The villains were pretty interesting and charismatic though. Not really the main villain though, but his partners. The scientist comes off as rather generic. His plans aren’t bad I suppose and he had a good super form but he just didn’t look as cool as the others. One big villain who kept showing up was this sentient Toaster. Perhaps the game meant for him to be a boom box or an oven but he looked like a Toaster to me so I’m sticking with that. He even had his own theme music which was really fun to listen too. While the Toaster’s redemption arc may be rather cheesy and hard to buy into considering just how mean he is, it could have been dragged out a whole lot more. He is the best character in the game for sure and you have to admire his drive and persistence. No matter how many times you defeat him he will come right back. Another villain who was cool was this evil fire mage/fairy creature who is bound to serve the one in control of the temple. As a result she works for the Scientist. She’s a good fighter and her abilities seem similar to that of Infinite’s. She doesn’t get to do a lot in the game but at least we do fight her once so that was neat. The soundtrack is limited but fairly good. As I mentioned, the Toaster got the best theme in the game. It’s just excellent and really makes you enjoy the fights. The rest of the themes aren’t bad, but you will hear them a lot so get used to it or it’ll be a tough time. The graphics aren’t quite as good as the music though. The levels are all fairly dark and the sprites are small. This makes it rather easy to get hit by stage hazards and the like even when you would have dodged them otherwise. This happened to me a few times in the final level with the stone spires. The graphics aren’t bad, it’s just that the lighting was dark which hurts the overall look. It’s still bearable though and just make sure you play in a well lit area. I also wonder if it might just be my 3DS since screenshots of the game look fine. In my playthrough you wouldn’t have even known how the main character looks if not for the cover. It’s like it was zoomed out too much or my 3DS is getting ready to kick the bucket. The game is reasonably long and took me 8 hours. I can’t say that there is much replay value beyond beating the game but there is enough. You can keep on chatting with everyone to find out more about this war torn world. You can also grab new weapons and I believe you do unlock a new level so that would be pretty fun. All in all, it’s definitely enough content to justify the price. The game will last you for a satisfactory amount of time and the level of difficulty will ensure you don’t beat the final levels too quickly. I died quite a lot in this game so I can definitely vouch for the game’s difficulty. Overall, Cave Story 3D is a fun game. The gameplay is on point and I did like how the weapon levels worked. It’s a very unique take on the leveling system in general and one that I’d say works. The plot may be vague and even by the end you don’t know what the full situation is, but the mystery aspect can be enjoyable in its own way. You don’t always need all of the answers. I’d recommend checking this game out. It’s a very solid side scrolling adventure with a lot of options on his to play the levels thanks to your array of weapons. When in doubt, just fly. That’s my motto in this title. 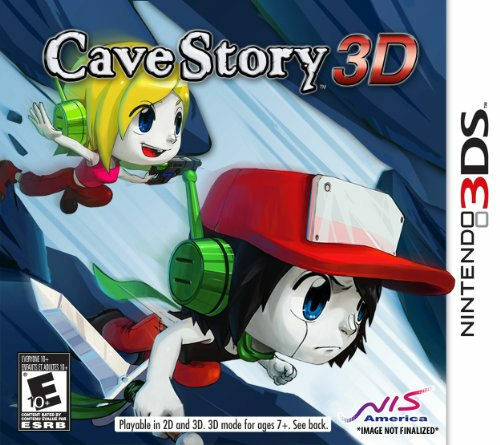 This entry was posted in 7 Star Games, Game Reviews, Games, Reviews and tagged 3DS, Cave Story, Cave Story 3D, Game Review, Nintendo, Remake, Review, RPG, Shooter, Side Scroller, Video Game Review by dreager1. Bookmark the permalink. I am terrible at avoiding damage in shooting games, so I imagine I would lose a lot of weapon energy in this game. Cave Story’s villain is a toaster? Yeah, those buggers are evil. I hate how they keep burning my bread.